Viknesh Vijayenthiran October 30, 2018 Comment Now! Chevrolet is out to prove that cars like its Camaro have a bright future in the world of electrification, at least as far as the dragstrip is concerned. 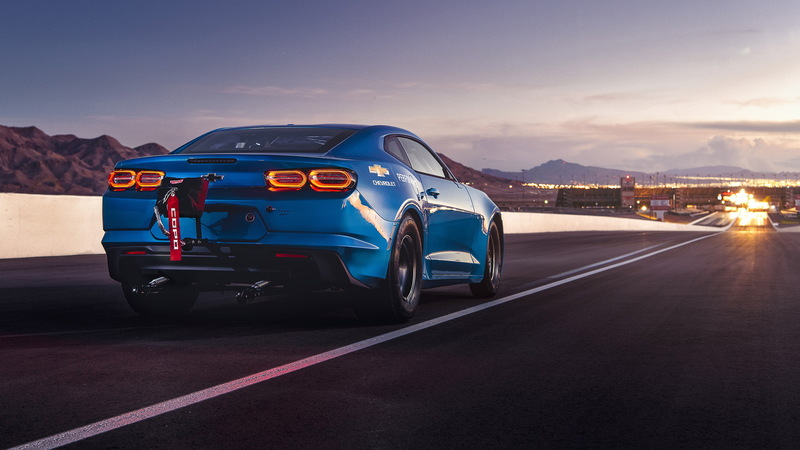 The automaker late on Monday unveiled the eCOPO Camaro concept ahead of the formal debut Tuesday at the SEMA show in Las Vegas. 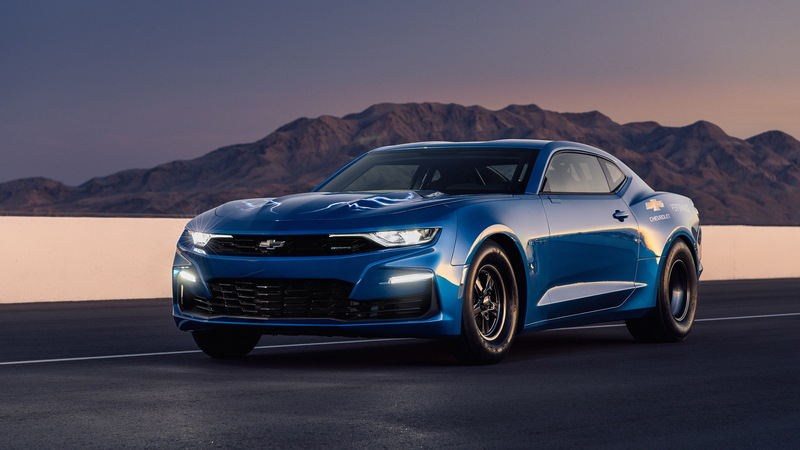 The concept is entirely electric powered, driven by an electric motor providing more than 700 horsepower and 600 pound-feet of torque, and it preview new technologies that could be coming to Chevrolet cars in the not too distant future. Developed with pioneering electric drag racing team Hancock and Lane Racing, which helped build an 8.0-second fourth-generation Pontiac Firebird electric drag racer known as Shock and Awe, the eCOPO Camaro also represents the first application of a new 800-volt battery and electrical system developed by General Motors. With 800 volts, charging times are much faster, which is important for the limited time between elimination rounds in drag racing. Testing is ongoing but Chevy is confident the car can run the quarter-mile in the 9.0-second bracket. The eCOPO Camaro's electric motor is based on a pair of BorgWarner HVH 250-150 motor assemblies, each generating 300 lb-ft. The setup sits in the engine bay and is connected to a conventional automatic transmission that channels drive to the same solid rear axle used in COPO Camaro drag racers. The battery pack is composed of four 200-volt modules, each weighing roughly 175 pounds and mounted strategically for optimal weight distribution. Two are located in the rear seat area while a third is in the spare tire well and a fourth sits over the rear axle. For added protection, the roll cage has been extended to surround the batteries. The arrangement results in a 44/56 front-to-rear weight ratio. 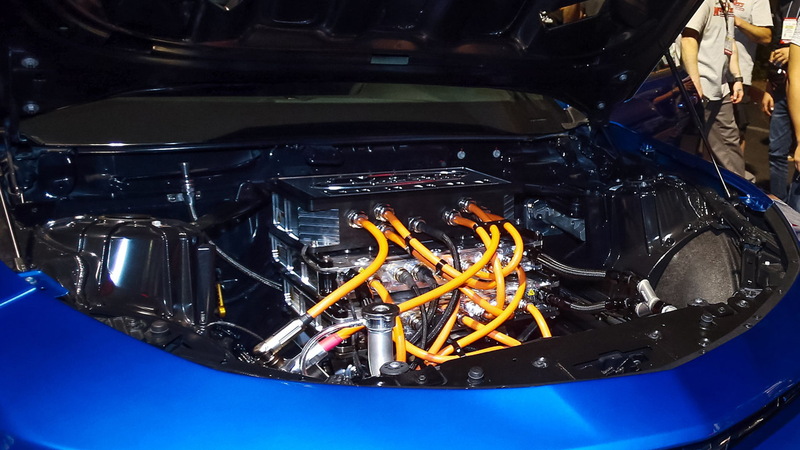 Interestingly, Chevy is already looking at the potential of aftermarket electric drive systems. For example, the eCOPO Camaro’s electric motor has the same bell house mounting pattern and crankshaft flange as the popular LS family of V-8s. This allows it to bolt up to just about any GM transmission. 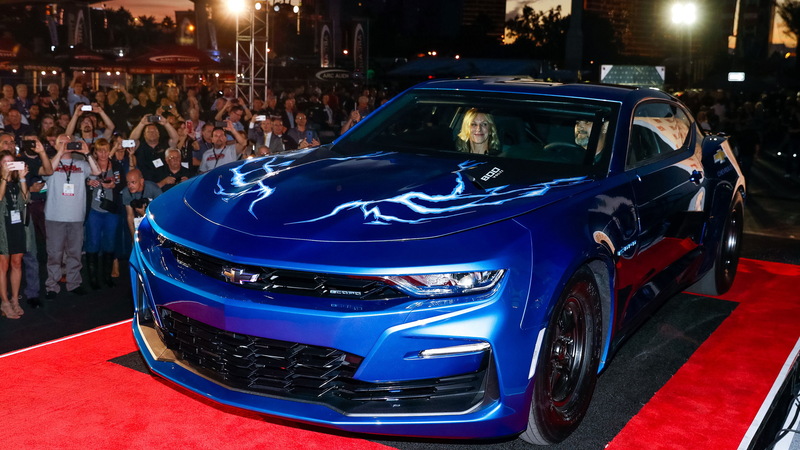 Chevrolet is also using this week's SEMA show for the debut of its 2019 COPO Camaro which marks 50 years since the original drag racing special was launched. The automaker also has some new crate engines, including the Corvette ZR1's 755-hp V-8. 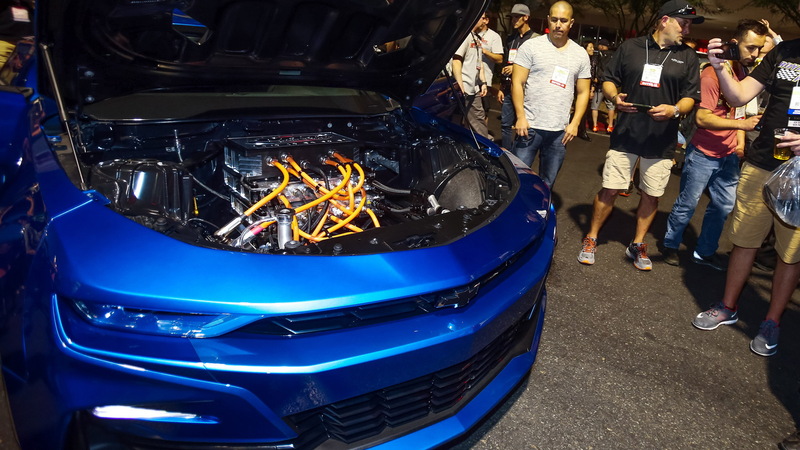 For our full SEMA show coverage, head to our dedicated hub.